10 L AT I N M A G A Z I N E Isabelle Lawrence was a much-loved English teacher at Latin for 36 years and a respected author of children's historical novels. 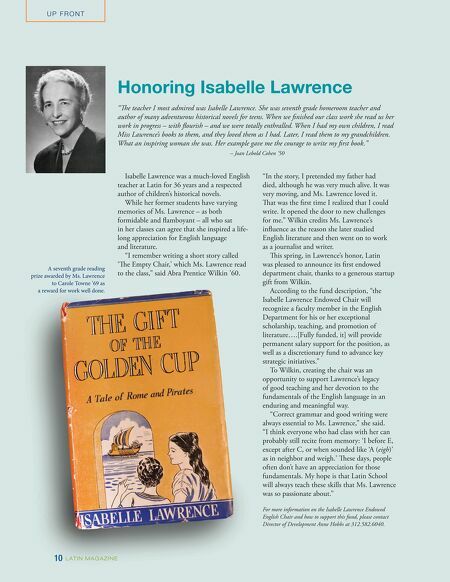 While her former students have varying memories of Ms. Lawrence – as both formidable and flamboyant – all who sat in her classes can agree that she inspired a life- long appreciation for English language and literature. "I remember writing a short story called 'e Empty Chair,' which Ms. Lawrence read to the class," said Abra Prentice Wilkin '60. Honoring Isabelle Lawrence "e teacher I most admired was Isabelle Lawrence. She was seventh grade homeroom teacher and author of many adventurous historical novels for teens. When we finished our class work she read us her work in progress – with flourish – and we were totally enthralled. When I had my own children, I read Miss Lawrence's books to them, and they loved them as I had. 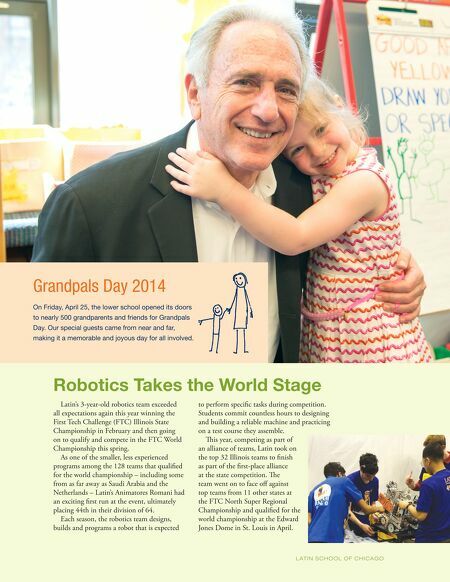 Later, I read them to my grandchildren. What an inspiring woman she was. Her example gave me the courage to write my first book." – Joan Lebold Cohen '50 "In the story, I pretended my father had died, although he was very much alive. It was very moving, and Ms. Lawrence loved it. at was the first time I realized that I could write. It opened the door to new challenges for me." Wilkin credits Ms. Lawrence's influence as the reason she later studied English literature and then went on to work as a journalist and writer. is spring, in Lawrence's honor, Latin was pleased to announce its first endowed department chair, thanks to a generous startup gift from Wilkin. According to the fund description, "the Isabelle Lawrence Endowed Chair will recognize a faculty member in the English Department for his or her exceptional scholarship, teaching, and promotion of literature…. [Fully funded, it] will provide permanent salary support for the position, as well as a discretionary fund to advance key strategic initiatives." To Wilkin, creating the chair was an opportunity to support Lawrence's legacy of good teaching and her devotion to the fundamentals of the English language in an enduring and meaningful way. "Correct grammar and good writing were always essential to Ms. Lawrence," she said. "I think everyone who had class with her can probably still recite from memory: 'I before E, except after C, or when sounded like 'A (eigh)' as in neighbor and weigh.' ese days, people often don't have an appreciation for those fundamentals. My hope is that Latin School will always teach these skills that Ms. Lawrence was so passionate about." For more information on the Isabelle Lawrence Endowed English Chair and how to support this fund, please contact Director of Development Anne Hobbs at 312.582.6040. U P F R O N T A seventh grade reading prize awarded by Ms. Lawrence to Carole Towne '69 as a reward for work well done.